Do you enjoy hunting for treasure? Of course you do, otherwise the DVR filled to the brim with Pawn Stars and the idiosynchratic nose-picking would just be weird. 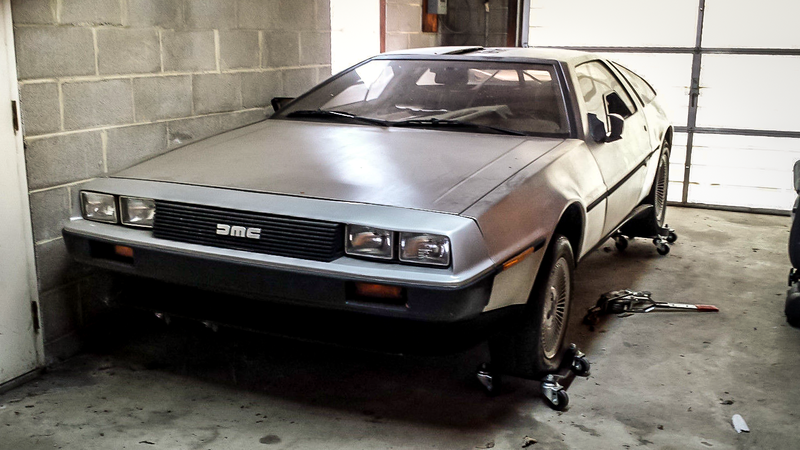 Well, on today’s edition of Barn Find Friday, we have this Delorean DMC-12, a blast from a coke-funded past...or was that future? This 1981 Delorean DMC-12 is one of the most iconic, of not the most iconic cars ever made. It has no paint on its bodywork, instead relying to get its trademark silver sheen from its brushed stainless steel panels. It was a rear-engined deal like the Porsche 911, but unlike the Porsche, Delorean was never given a chance to work out the car’s almost countless quirks. Fast forward to today, where collectors, coming down off a high that started with the Back To The Future collection on Blu-Ray, realized that it was a buyer’s market and bought up all of the bone stock examples and stuck in a flux capacitor because that’s what Doc Brown would’ve wanted. The car has one ding in the right rear quarter panel. We removed the rear vents for safe keeping while working starting to work. Car has been in storage for 10 years. Circumstances have changed and it is time to sell. Easy project car! Car was originally purchased in Louisiana and we do have the original records, owners manual and sales literature. Original owner was a woman and car has not been titled since. If I had the space, I’d definitely get an early Delorean. Actually, I’d prefer that it be a project, which would at least give me a head start on the disassembly. I’m not sure where exactly the bidding will go, but I’d wager that it would struggle to hit 20k, and at that price, you’d have to restore it to its original glory, adding a few much-needed power adders along the way and simply get paid to wait. Buy it as an investment, or buy it as an awesome weekend cruiser. Hell, you could daily drive the thing and be cooler than any supercar-owning jabroni in the country. Get it before I buy land and start hoarding these things.